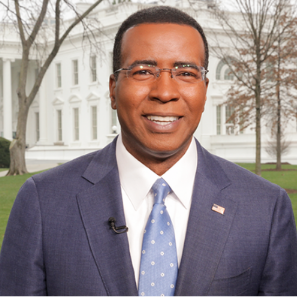 Kevin Corke currently serves as FNC's White House correspondent. He joined the network in 2014. We are excited to announce April 8th at 1055 a.m. our Norman P. Blake Family Distinguished Speaker, Mr. Kevin Corke, will speak to the Corps. Before joining FNC, Corke spent four years as a member of the White House Press Corps covering the George W. Bush administration (2004-2008) for NBC News. His coverage experience in Washington includes reporting from the Pentagon, Supreme Court, Capitol Hill, and the U.S. State Department. In trips all over the globe aboard Air Force One, Corke has reported from numerous continents covering issues ranging from politics and international policy to trade and terrorism. Previously, he has reported for the Today Show and NBC Nightly News. In political campaign cycles he served as an anchor for MSNBC's Super Tuesday political coverage. As a journalist, Corke has covered a variety of stories, including the Virginia Tech tragedy, the last Space Shuttle flight, hurricanes, and nearly every major American sporting event. He has served as primary news anchor at WTVJ-TV in Miami, anchor/reporter at KUSA-TV in Denver and hosted ESPN's SportsCenter, as well as broadcasted games for the network. Corke is a graduate of Harvard University's Kennedy School of Government, where he earned a Littauer Fellow citation for academic excellence, leadership, and commitment to work in the public interest. He also has earned both a Masters and Bachelor degrees in journalism from the University of Colorado, Boulder.